From simple 1 page brochure-style websites to fully integrated online shopping systems, we can create your business a professional and stylish website. Looking for somewhere to host your existing websites or emails? We can help. Looking to tidy up or modernise your website for the current market? We can provide monthly or one off maintenance packages to keep on top of this for you. We have experience in helping businesses boost their website traffic and give them that little nudge up the search engine results. From making your website code more visible to search engines to full revamps and Google advertising campaigns. For further information on the services we offer or just to discuss your requirements, call us on 07956 218 032. 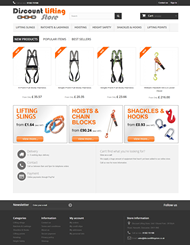 An online e-commerce shop selling lifting equipment and safety related items. A 6 page website exhibiting Anna Smith artwork. Includes galleries of paintings and prints.